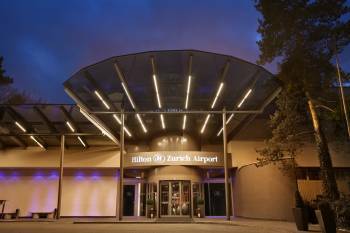 Suited in the heart of Zurich’s northern business district and surrounded by forest and fields. Benefit from a central location, just 5 minutes from the airport and 15 minutes from the city centre with its famous sights. With a spacious conference-area of 25 meeting rooms, modern design and a broad variety of business facilities, the hotel represents the ideal venue for any event. With a spacious and flexible conference area of 1.360m2, modern design and a broad variety business facilities, the hotel represents the ideal venue for any event – from global conferences to classy gala events. Hilton Zurich Airport offers a wide range of options, including boardrooms, ballroom and our multifunctional Panorama room. The Panorama A-C can be divided into 3 separate sections, or used as one complete room to hold events for up to 260 guests. All meeting rooms have natural daylight. Hilton Business Centre, where our dedicated team members offer you personalized service at any time during your event. Our large Europe foyer ideal for exhibitions and coffee breaks.